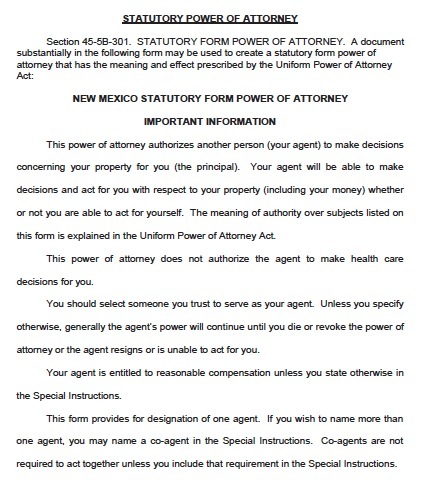 Also known as the “Statutory Power of Attorney Form”, in accordance with State Statute 45-5B-301 in New Mexico offers the ability to grant almost any type of power over your property to an agent by filling out a simple form. You can also choose just one power your agent can have, and you can limit this to a particular period. This is useful, for example, if you will go on vacation for four weeks, and only need someone to perform one task, like paying your bills, during that time. There are certain other powers that the principal must specifically authorize for the agent to perform, such as creating or revoking trusts, making a gift, changing a beneficiary, or disclaiming an interest in property. In New Mexico, it is recommended to have two witnesses sign the form, but it is not required.